Insomnia. At one time or another, most of us have experienced its bothersome symptoms: difficulty falling asleep, staying asleep, or both. We may have suffered bouts of insomnia that last a few days, or much longer. 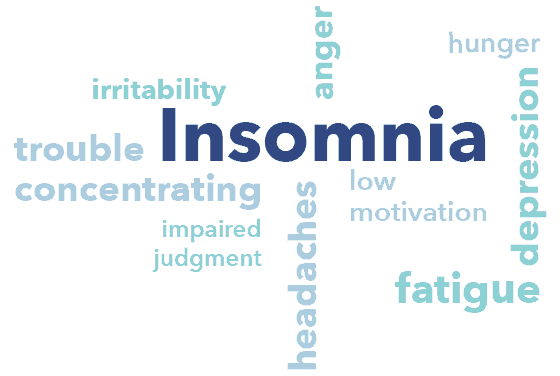 Though the symptoms may seem simple enough, insomnia is a complex condition with a wide variety of causes. Insomnia is classified as a sleep disorder, and is defined as the inability to fall asleep and/or stay asleep, or not feeling rested after sleep. It may be transient, acute, or chronic. Insomnia is by far the most common sleep disorder, affecting as much as half the world’s population at some point in their lives. One of the defining features of insomnia is that it interferes with daytime functioning. (2) This difficulty may take the form of fatigue, trouble concentrating, irritability, or memory lapses. Microsleep episodes may occur, along with impulsiveness or depression. In addition, insomnia sufferers may experience impaired decision-making (3), relationship difficulties, and reduced quality of life. To fall or stay asleep, they may over-rely on sleeping pills or supplements. Sleep-related anxiety that begins with a transient bout of insomnia may become a persistent issue. Insomnia symptoms can range from mild to severe, and fluctuate over time. It is possible for symptoms to improve during different times of life and then recur. Insomnia Vs. Sleep Deprivation — What’s the Difference? Because insomnia and sleep deprivation share some physical and cognitive effects, they may be confused. Though both can result in a feeling of fatigue or trouble concentrating, they are not the same. Sleep deprivation is willingly depriving oneself of sleep. Insomnia is the inability to sleep, stay asleep, or get back to sleep. A person may experience sleep deprivation while studying for exams, traveling, or attending to a sick child. If offered the opportunity, the person who is sleep-deprived is able to sleep. The person suffering from insomnia, however, can’t sleep even when given the chance. Insomnia concerns sleep quality, while sleep deprivation concerns sleep quantity. Insomnia and sleep deprivation may have some important differences, but aren’t the symptoms the same? Not exactly. Sleep deprivation can result in daytime sleepiness, poor concentration, memory problems, and decreased emotional control. Some studies show similar deficits in people suffering from insomnia, but there are some significant distinctions. Hyperarousal of the sympathetic nervous system may be at play in some cases of chronic insomnia, preventing sleep and a feeling of sleepiness at night. (4) This hyperarousal may also prevent insomnia sufferers from experiencing the same daytime sleepiness and cognitive impairments experienced by those who are sleep-deprived, even when they operate on the same amount of sleep. This could mean that current testing techniques don’t adequately show the physical and cognitive effects of chronic insomnia, or it could mean that, though insomniacs are similarly affected by lack of sleep, hyperarousal of their nervous systems overrides these impairments, allowing them to feel more alert. Another difference between those who are sleep-deprived and those suffering from insomnia is the ability of sleep-deprived people to fall asleep quickly when given the chance to sleep. Even when deprived of their usual amount of sleep, chronic insomniacs tend to fall asleep less quickly than the sleep-deprived, wake up sooner, and have more trouble staying asleep. Insomnia used to be divided into two categories — primary and secondary. Primary was thought to be insomnia without an apparent cause, while secondary was thought to be caused by something else, such as another medical condition, mood disorder, or medication. These categories are no longer as commonly used, however, and recent research shows that nearly all cases of insomnia have a discernible cause. While the symptoms of insomnia may come and go, they often resolve by themselves when a stressor passes, an illness is treated, or a usual sleep routine resumes. Treatment is typically unnecessary, though the anxiety and negative associations of the symptoms may persist, contributing to a feeling of wakefulness at night and the possible development of insomnia disorder. Insomnia disorder goes beyond the symptoms of insomnia. Commonly known as chronic insomnia, insomnia disorder occurs at least three nights each week for three months or longer. Approximately 10% of adults in the US have insomnia disorder. Contradictory as it may seem, insomnia disorder has little to do with the amount of time spent asleep. Insomnia disorder concerns the inability to fall asleep, stay asleep, or fall back to sleep. Insomnia disorder typically results from a negative conditioned response to bedtime, the attempt to sleep, or the sleeping environment. Less commonly, it may be caused by neurological difficulties such as head injuries. Though symptoms of insomnia may be caused by such varied factors as job stress and drinking alcohol (7), these generally are not the cause of insomnia disorder. Insomnia disorder is chronic, and often resistant to typical treatments for short-term sleep difficulties. Women suffer in greater numbers than men from medical conditions that may cause symptoms of insomnia, including certain autoimmune diseases, migraines, and pelvic pain. They are more at risk of osteoporosis, which can cause joint and spinal pain and make sleep challenging. In addition, women are more likely to experience the responsibilities of single parenting and primary caregiving for older relatives. These stressors may contribute to higher rates of insomnia symptoms, as well as fewer hours available to sleep. A diagnosis of insomnia may be further broken down into more detailed sub-types and stages. 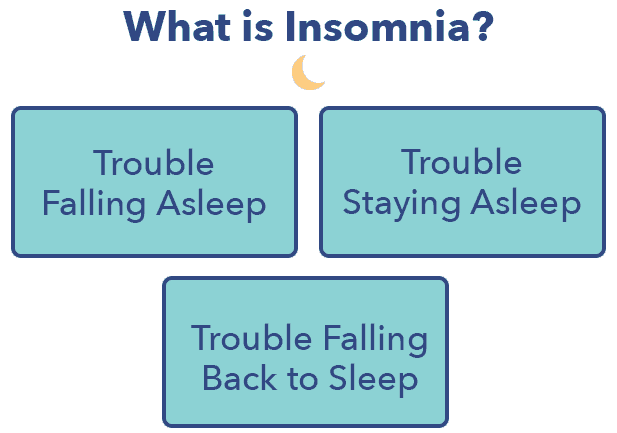 The three main insomnia sub-types are differentiated by the duration of the condition. Though the symptoms are similar, prognosis and treatment may change according to final diagnosis. 1. Onset Insomnia. The definition of onset insomnia is the inability to fall asleep for more than 30 minutes after going to bed. This type of insomnia is often associated with a conditioned negative response to bed, as well as elevated levels of anxiety and hyperarousal of the nervous system. 2. Middle Insomnia, also known as Sleep Maintenance Insomnia. Middle insomnia is characterized by waking during the night, and extended periods of time spent awake. This sort of insomnia may be the result of illness, another sleep disturbance such as nightmare disorder, or chronic pain. Another common cause of middle insomnia is consumption of alcohol. Though alcohol may make falling asleep easier in some cases, it can lead to waking during the night once the central nervous system effects wear off. 3. Late Insomnia. Waking too early in the morning is the defining feature of late insomnia, which may be experienced during the aging process as sleep patterns change. It is also a common symptom of mood disorders like depression. Stress and anxiety can create a sort of internal “alarm” that leads to consistent early-morning awakening. Insomnia treatments may be tailored to a sufferer’s particular sub-type and stage of sleep disturbance. For instance, those experiencing grief may have transient insomnia symptoms and wake early in the mornings, while those with chronic pain may lie awake or be unable to fall back to sleep during the night. Psychotherapy may be helpful for some sufferers, while others may benefit from cognitive behavior therapy and restriction of time spent in bed. How Can Narcolepsy Cause Insomnia Symptoms? Narcolepsy is perhaps the best-known type of hypersomnia, a range of sleep disturbances characterized by unusual daytime sleepiness and excessive time spent sleeping. Narcolepsy appears to be an autoimmune disease triggered by a viral illness, usually in childhood or adolescence. Symptoms of narcolepsy include sleeping up to sixteen hours each day or more, needing to take naps after a full night’s sleep, grogginess, suddenly muscle weakness while laughing or experiencing strong emotion, and…insomnia? It may seem impossible for insomnia symptoms and narcolepsy to co-exist, but often they do. Narcolepsy causes not only excessive daytime sleepiness, but interrupted sleep and wake cycles. Sleep is typically not restorative, and may be disturbed by parasomnias such as sleep paralysis and hallucinations. DNS differs from classic insomnia in that narcolepsy patients don’t usually have difficulty with falling asleep, but frequently contend with disrupted sleep and middle insomnia in addition to typical narcolepsy symptoms. DNS can be part of the constellation of symptoms associated with narcolepsy, leading to periods of poor sleep despite the amount of time sufferers must spend in bed. While the occasional bout with insomnia symptoms may be difficult to avoid, insomnia that lasts more than a few weeks or becomes chronic may have serious health effects. Insomnia may lead to long-term sleep debt, which can result in disruptions to metabolism, mood, and glucose tolerance. 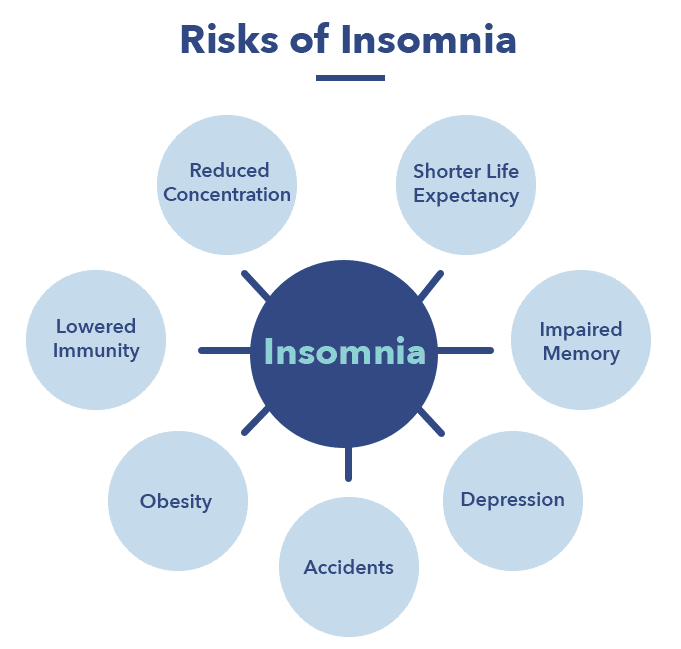 Though hyperarousal of the central nervous system in chronic insomnia may help the body overcome some of these cognitive and physical impacts of insomnia, at least 40% of long-term insomnia sufferers report feeling some daytime effects of insomnia disorder. Medications to treat psychiatric disturbances may also cause insomnia. Psychotropic medications may have stimulating effects that contribute to interrupted sleep. Restless leg syndrome and periodic limb movements may be triggered or exacerbated by antidepressants and other drugs used to treat mood disorders. Which Came First, the Mood Disorder or the Insomnia Symptoms? Why? 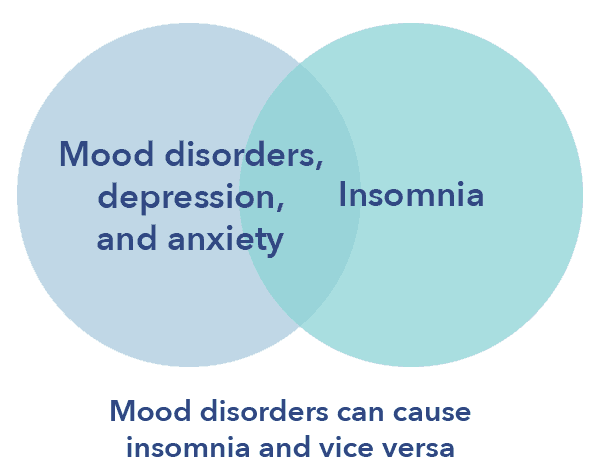 Though the connection between mood disorders and insomnia isn’t entirely clear, it is well-known that hormones and neurotransmitters are affected by disturbances in sleep. Sleep is a restorative activity that reduces stress in the body and particular areas of the brain, especially the axis between the hypothalamus and adrenal and pituitary glands. Excess secretion of cortisol — also known as “the stress hormone” — may play a role, as well. Reality: Insomnia symptoms can happen for a vast number of reasons. While anxiety is a common cause, it’s only one of many factors that can provoke this sleep disorder. Reality: Insomnia might involve the inability to fall asleep, or manifest as frequently waking during the night, waking early, or feeling sleepy during the day. Someone who can fall asleep quickly may still be diagnosed with insomnia if they can’t remain asleep, wake too early, or suffer from fragmented, low-quality sleep. Reality: Remaining in bed when you can’t sleep may signal to your brain that your sleeping environment is where you lie awake. It may also heighten anxiety, making it harder to doze off again. Most experts agree that if you don’t fall back to sleep within 15 or 20 minutes of waking up, it’s best to get out of bed and participate in a relaxing activity such as listening to soothing music or reading. 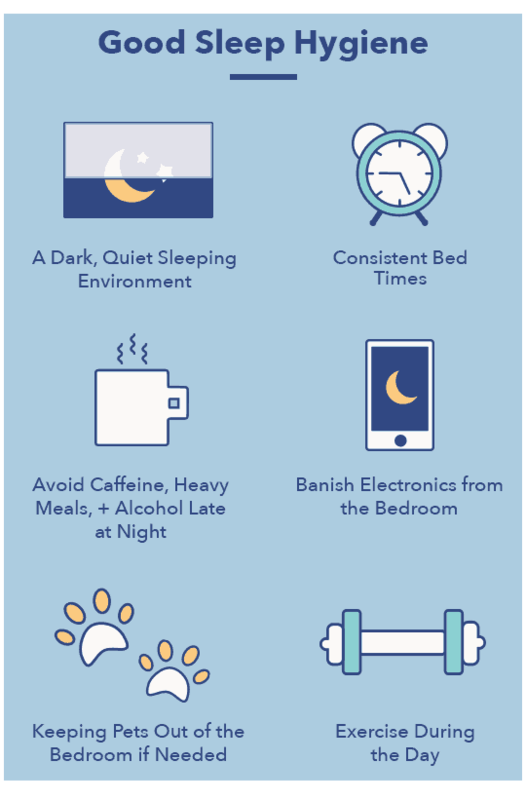 Though it may contradict much of what we’ve heard about treating insomnia, good sleep hygiene is often not an effective treatment for chronic insomnia. Good sleep hygiene can help with less persistent sleep difficulties, but is not a first-line treatment for insomnia disorder. 1. Sleep restriction. Sleep restriction requires limiting the time spent in bed to the number of hours typically spent asleep. For example, if you usually spend eight hours in bed but lie awake for two, sleep restriction therapy might require you to go to bed at midnight and get up at 6 am. Going to bed later is usually recommended during this type of treatment, rather than getting up earlier than your normal time. Though it may seem to compound the problem of insomnia, sleep restriction therapy increases sleep efficiency and cuts down on waking during the night. Once someone undergoing training is sleeping well for six hours without waking, 15-minute blocks may be added to the time spent in bed, increasing gradually until the person feels rested during the day. This type of therapy protocol can train the brain to associate a particular environment and time of night with sleep, and break the conditioning that causes delayed, fragmented, or low-quality sleep. 3. Relaxation training. This type of training teaches insomnia sufferers to use a combination of meditation techniques, guided imagery, and breathing exercises to prepare the body for sleep. Biofeedback helps patients learn to control the body’s normally involuntary bodily processes, such as heart rate, blood pressure, and muscle tension. This combination of techniques helps to relax the body, calm the mind, and make falling asleep easier. 4. Psychotherapy. This aspect of the protocol involves challenging negative beliefs about sleep, and replacing fearful associations with positive thinking. Worrying may be relegated to a particular time of day so the evening and just before bed become times of relaxation. Insomnia patients in cognitive behavior therapy learn to manage stress and control the over-active thought process that may lead to sleep difficulties. Though it’s rarely effective for chronic insomnia, good sleep hygiene may help with less severe and persistent insomnia symptoms. Insomnia may be common, but it doesn’t have to be chronic. Addressing the problem early, treating underlying conditions, and practicing healthy, sleep-promoting habits may be all that’s needed to return to deep, restorative slumber.